But, who would have guessed that there would be a protest in Rangoon itself, the capital of Burma! Nu Lwin, Secretary and Spokesman for the National League for Democracy (NLD) speaks to 300 supporters in Rangoon on May 27, 2005, the 15th Year Anniversary of the thwarted election victory. Some 300 opposition National League for Democracy party members and supporters, together with about a dozen foreign diplomats, gathered in the NLD’s Rangoon headquarters on Friday under the watchful eye of plainclothes police and other security officials. It was a subdued celebration of the 15th anniversary of an election that wasn’t. The 1990 election, called by a military regime in power for 28 years, turned out to be a festival of democracy, as the NLD won it hand’s down. But celebrations then quickly became as sombre as Friday’s as the realization set in that the ruling regime’s generals discovered they had made a mistake—and ignored the election result. It was two years ago on this anniversary that Burmese government-affiliated forces used bamboo staves and metal pipes to kill or injure members of the NLD and pro-democracy supporters in NLD Leader Suu Kyi’s convoy. The US called on the Burmese junta to release immediately and unconditionally all political prisoners, including Suu Kyi and NLD Vice-Chairman Tin Oo, and to permit the re-opening of NLD offices. 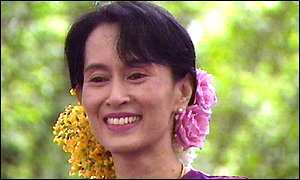 NLD leader Aung San Suu Kyi was not able to attend the ceremony. The Nobel Laureate has been under house arrest for two years following a violent ambush by a pro-junta mob. The junta has clamped down on the NLD and launched its own seven-step “road map” to democracy, which outlines what so far has been only a halting path to the reforms demanded by the international community. The junta has opened constitutional talks as a first step on its road map, but adjourned the latest session after six weeks and suspended the meetings possibly until the end of the year. 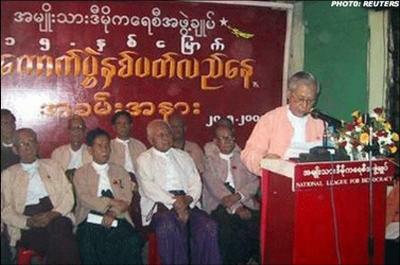 The talks were boycotted by the NLD, Burma’s largest opposition party, and were derided by western countries as a farce. The result has been a political stalemate as the country’s economy crumbles. 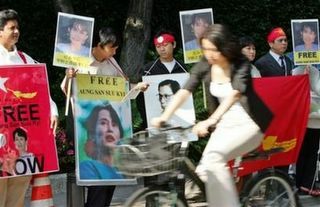 A Myanmar democracy protest in Tokyo on Friday, May 27th. The United States urged Myanmar’s military junta on Thursday to release democracy leader, Aung San Suu Kyi and other political detainees, ahead of the second anniversary of a brutal attack on the Nobel laureate and her supporters. The US urged the military rulers “to release immediately and unconditionally” Suu Kyi and other party leaders, U Tin Oo, Khun Htun Oo, as well as all political prisoners. It also sought the re-opening of her party’s offices and urged the junta to hold a “meaningful dialogue” with the democratic opposition and ethnic minority groups to respect fundamental human rights of the Myanmar people. More on Burma here, here, and here.